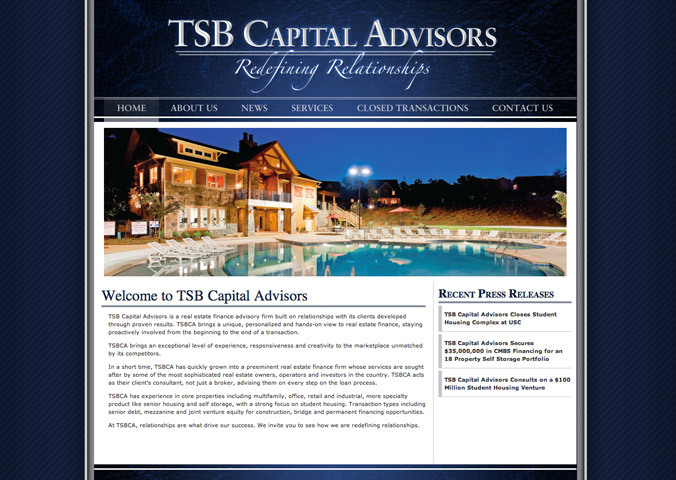 In spring 2011, real estate finance firm TSB Capital Advisors requested the assistance of Kernie Cam Productions to redesign the look of their website. Aiming for a sleek, professional design with user-friendly navigation, the new site went live in early January 2012 and features a company overview, news blog, contact form, and an image gallery of closed transactions. The site was built using HTML, PHP, and CSS within the Word Press content management system.